Unlike any other major web browser, Opera now includes a VPN as part of its standard service. We explain what to do if Opera’s VPN doesn’t work for you, how to fix problems you might have with the Opera VPN, and the differences between what Opera offers and a traditional Virtual Private Network (VPN). These days, more and more platforms are using geo-blocking to prevent people from outside of a specific country from accessing the service. VPNs work by encrypting your traffic and routing it through an intermediary server. They not only enhance your online security, they also allow you to bypass regional restrictions and use previously inaccessible services abroad. However, when something doesn’t work as expected, it’s often difficult to tell if the problem lies with the VPN you’re using or some other, less obvious cause. Despite claiming to be a VPN, what Opera actually offers is a free proxy; its standalone VPN service was discontinued in early 2018. Proxy servers are poor alternatives to dedicated VPNs (like ExpressVPN), since they often have slower speeds, less secure encryption, and lacklustre unblocking capabilities. However, Opera’s VPN might be useful in some situations. That’s why, in this post, we’ll be addressing some of the most common problems users experience with the service. TIP: If you want a fast, reliable VPN service we’ve outlined some good alternatives to Opera here. In theory, Opera’s VPN should be easy to use: just open the browser, select the continent you’d like to connect to, and start using the web free from regional restrictions or online censorship. Below, we’ll explain why these issues occur and what you can do to rectify most problems with Opera’s VPN. The quickest, easiest way to fix many VPN problems is to simply cancel the connection attempt, restart your browser, then reconnect to the VPN. You can do this by hitting the VPN button in Opera’s address bar and clicking the toggle button at the top twice. Were you able to connect? If so, fantastic, but if not, try the steps below. Most VPNs are made up of servers spread throughout numerous countries. Usually, you can choose to use a server in a specific country, but Opera’s VPN works slightly differently. Instead, this service simply has the user choose between a server in Europe, Asia, or the Americas. The first step to resolving connection problems with a VPN is to eliminate the server you’re using as a cause. Sometimes, servers are taken offline for maintenance and the software you’re using doesn’t automatically update its server list, leaving you unable to connect. 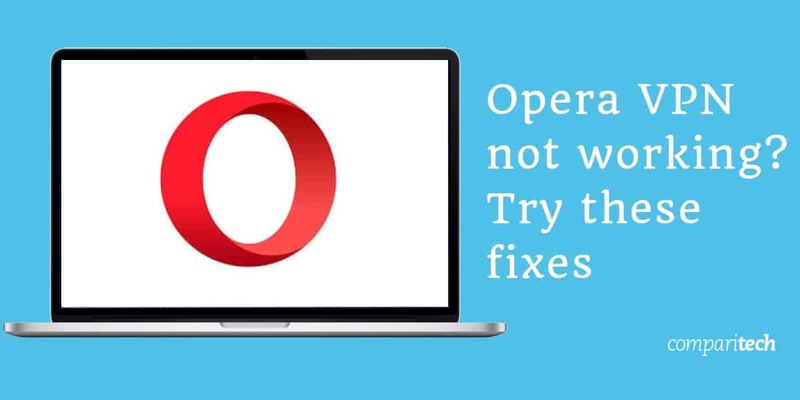 Opera has multiple servers in each region, though, so unless it runs maintenance on every server in a given continent simultaneously, this is unlikely to be the cause of your problem. It’s also possible that the server works, but your connection is timing out. This could be because the server you’re trying to use is under heavy load (there are usually more users online in the evenings, for instance) or because you’re trying to use a server that’s too far from your physical location. Generally, the further away a server is from you, the slower your speeds. As such, if you try to use a server on the other side of the world, you may not be able to connect at all. If this is what’s causing your problem, you can fix it by connecting to a server in a different location. If you can’t connect to any of the VPNs servers, it might be worth checking that you have the latest version of Opera installed. This is a crucial but often-overlooked step. If everything looks good there, you could try turning off any browser extensions you might have installed. To do this, click the Opera icon in the top-left of your screen, hover over Extensions and click on Extensions in the list that appears. You should see a list of your Opera extensions. By default, there’s just one: the Opera Ad Blocker. Go ahead and click the Disable button. Once this is done, try connecting to the VPN again. Note that if this doesn’t solve your problem, it’s best to enable the Opera Ad Blocker again afterwards. There’s a chance that your firewall or antivirus is mistaking Opera’s VPN for malware. To find out, you can try adding an exception, which tells your programs that Opera is safe. This should be fairly simple to do but the process will be slightly different for every program. Below, we’ll explain how to add an exception in Windows Firewall and AVG AntiVirus. Go to Control Panel > System and Security > Windows Defender Firewall > Allow an app or feature through Windows Defender Firewall. You’ll see a list of your installed programs; if the two boxes next to Opera are checked, it’s already allowed through the firewall. If not, click the Change settings button, make sure both of those boxes are checked, and click OK.
From AVG’s main screen, click the Menu option in the top-right, then the Settings button. There’s an Exceptions dropdown menu under the General tab, although no list of installed programs. 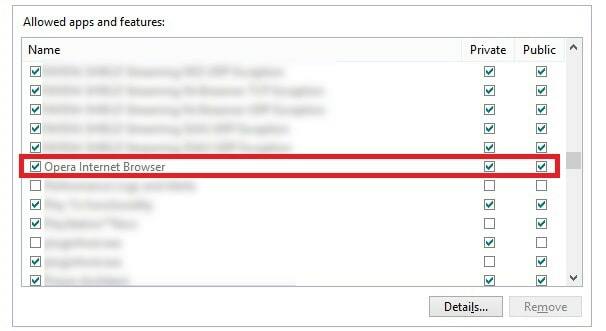 Instead, you’ll have to click the browse button and locate your Opera folder manually. This is usually saved in Program Files on Windows computers, or the Applications folder on Mac. Once you’ve located the Opera folder, click it, find the latest version (the sub-folder with the highest number). Now, check the box beside it and click the OK button at the bottom to be returned to the exceptions page. Click OK again here, and try using the VPN again. There are a few reasons why you might not be able to unblock certain geo-restricted services abroad with Opera’s VPN. Below, we’ll go into more detail on this problem and suggest some possible solutions. Popular platforms like Netflix and Amazon Prime Video upgrade their geo-restriction measures periodically to prevent VPN users from accessing content that’s only supposed to be available in specific countries. VPN providers respond in kind, updating the way their services work to once again fly under the radar. However, rolling out these updates across a whole network takes time. This means that occasionally, there are only a few servers capable of unblocking a given service abroad. While many paid VPNs allow you to directly ask support staff which servers work, Opera doesn’t. 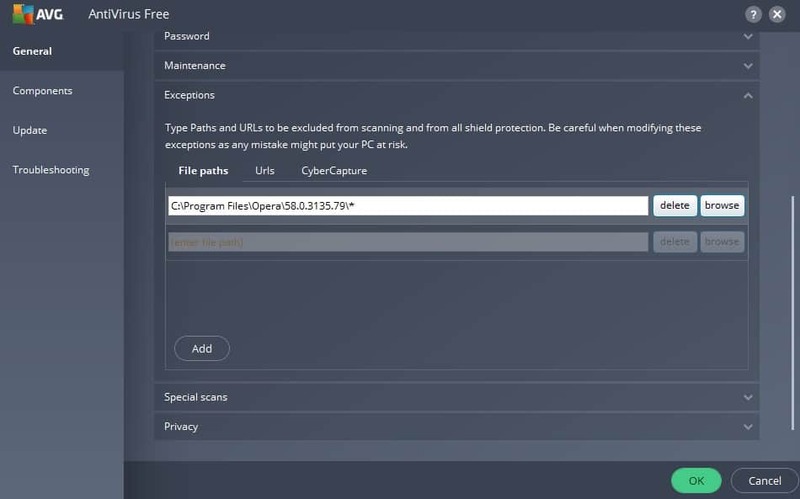 This means that the only way to see if other servers can unblock your chosen platform is to repeatedly reconnect to Opera’s VPN and see if you gain access or not. Of course, it’s also possible that Opera’s VPN just isn’t able to bypass the platform’s geo-restriction, in which case, no amount of reconnection will help. Sometimes, if you try to access a geo-blocked site from abroad, it will store a cookie in your browser and automatically reject any subsequent access attempts. Due to this, you might find yourself unable to use a foreign service even when connected to a VPN. The solution here is simple: clear your cookies. Start by clicking the Opera logo and scrolling down to Settings. 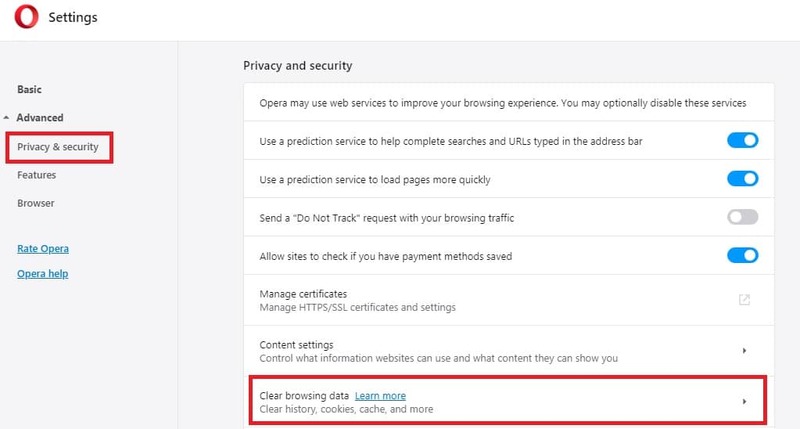 From here, click the Advanced tab on the left and select the Clear browsing data option in the Privacy & security section. Click the checkboxes next to Cookies and other site data and Cached images and files, then click the blue Clear data button. Don’t worry if you still can’t connect: these tests help point us to the root cause of your problem. What if none of the above solutions work for me? If you’ve followed all of the steps above and Opera’s VPN still won’t let you connect, you might be using a network which blocks traffic from VPNs and other proxies. In such cases, a free VPN is unlikely to work. This is especially the case if you live in a country with strict online censorship (such as China or Saudi Arabia). If you can connect, but can’t access a particular geo-restricted service, it’s likely every user is affected, not just you. Streaming services, in particular, put lots of effort into stopping VPN users from using their platforms abroad. Often, free VPNs just don’t have the resources (or intention) to find a workaround. Should I use Opera’s built-in VPN? While it’s good to see a web browser include more advanced security features, Opera’s VPN has a few major flaws. To begin with, it’s not really a VPN: as it only encrypts your browser traffic, it’s essentially a proxy, similar to the browser extensions offered by some VPN services. This means that you can’t use Opera’s VPN to torrent safely or keep your information secure when using other apps. Further, you have to manually enable the VPN for each tab. This is less than ideal and easy to forget about; hardly the stress-free protection you expect when using a VPN. There are also privacy and security issues to consider. 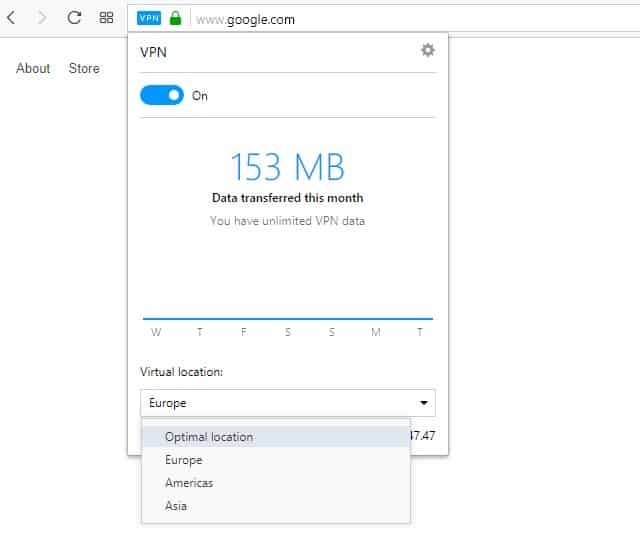 Opera’s VPN doesn’t include any additional security features like a kill switch (these keep you safe by automatically stopping data transferal if you suddenly disconnect from the VPN). This means that if you lose your connection for a moment, you could go on browsing without realizing you’re unprotected. Finally, Opera’s own VPN is a poor choice for anyone looking to stream geo-blocked content abroad. While it used to be able to unblock Netflix, this is no longer the case. In fact, it now struggles to bypass all but the most simplistic regional restrictions. Opera’s decision to have users choose a continent to connect to, rather than a specific country, presents additional problems. For example, if you’d like to use a Mexican service from Europe, you have to repeatedly connect and disconnect to the appropriate continent and hope you’ll eventually get connected to a Mexican server. Given Opera’s lack of a publically-available server list, we’re not even sure such a server exists. Are there better alternatives to Opera VPN? The good news is that there are plenty of high-quality VPNs available and they don’t cost very much at all. One of the biggest advantages these have over Opera’s VPN is that they encrypt traffic from all of your apps, not just your browser. Additionally, these services generally offer more security features, better unblocking ability, the option to choose a specific country, and clearer indications of what information they log. We recommend ExpressVPN. This service offers high-speed servers in more than 90 countries and can easily unblock popular platforms like Netflix, BBC iPlayer, and Amazon Prime Video from abroad. Best of all, ExpressVPN uses effectively uncrackable encryption and doesn’t log any personally identifiable information, meaning your activities can’t be traced back to you. If you’re looking for a similarly versatile, low-cost alternative, NordVPN and CyberGhost are both excellent choices. 4 What if none of the above solutions work for me? 5 Should I use Opera’s built-in VPN? 6 Are there better alternatives to Opera VPN?